It’s been a little over two years since the new city of Toronto, formerly Metropolitan Toronto made the colossal mistake of electing Rob Ford as mayor. Time flies when you’re having fun; actually, fun probably isn’t the most appropriate word to use. Two years since we took a mostly inept councilor, and made him the mayor. As a former resident of Toronto’s Ward Two, Rob Ford’s springboard to success, it’s easy to say that I was one of the many that saw this coming. While other communities were flourishing with new construction, our skies were conspicuously absent of those cranes that have come to represent the progressive Toronto landscape we know today. While property values were busy doubling, even tripling within a decade in the more desirable parts of Toronto, Ward Two decided to sit that party out. For lease and for rent signs littered north Etobicoke before the 2008 recession, and continue to long after it. It is a neighbourhood most people drive through (good luck taking the TTC around those parts) on the way to their actual destination, and it shows very few signs of changing any time soon. Rob Ford is the poster boy of all this nothingness, equaling this nothingness at city hall by simply voting no on everything and putting forward very few, if any, policy proposals of his own during his astonishing ten years as our city councilor. The astonishing part being that we voted him in three times in a row. Ready-made for the Mayor’s chair. So why did we do it? Why did we take this relatively unknown, unsuccessful, unfit councilor from a neighbourhood we only think of when we’re on our way to the airport, and make him our mayor? Were we sick of our educated, urban minded, highly qualified mayor David Miller? Obviously some of us were. But did we have to swing the pendulum so far to the other side of the spectrum? To a candidate that possessed none of those traits? An anti-urban mayor spells trouble for any city, especially one like ours, with its older, denser core, surrounded by suburbs. Kudos to the Rob Ford campaign for navigating this landscape brilliantly. Fabricating an “us versus them” battle between downtown and the suburbs was excellent political strategy. The unfortunate truth is that it worked all too well. 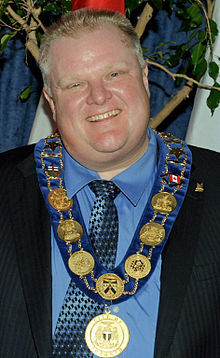 One of the many questions that has always plagued me is why Rob Ford wants to be mayor of this city in the first place. Judging by his behaviour and overall demeanor, it doesn’t even look like he likes living in Toronto, let alone leading it. He skips town during the Pride parade, hates any form of surface level transit, drives a gigantic SUV (and doesn’t even know the proper procedure of driving beside a streetcar with its doors open). No offence against one’s personal tastes and preferences, but someone like Rob Ford probably isn’t who you’d expect to be in charge of a world renowned, culturally diverse, dynamic metropolis like Toronto. So where would we be without him? Better off? Worse? This ‘what if’ depends who you ask, I suppose. The Sheppard East LRT would be at least one year ahead of schedule in its construction than it is today. Thanks to Rob Ford, we got to re-live the imagined “subway vs. streetcar” debate over and over again like some sort of bad reality TV show marathon. Well, it was actually a handful of kilometers of subway that would serve a few versus an extensive light rail rapid transit network that would have served many but let’s not water down the rhetoric with trivial facts. Weren’t those debates fun? Again, fun might not be the word I’m looking for. Or maybe, the citizens of Toronto would have a different view of city council as a whole, the mayor himself included. Never before has council looked so aimless, childish and downright incompetent than it does right now. I think it’s safe to say that the council chambers would be a friendlier, more bi-partisan environment if Rob Ford hadn’t run for mayor in the first place. But that was part of what he wanted to do, right? A large plank in his largely imagined platform was to change the culture of city hall. We all probably equated that to just being a part of stopping the gravy train, respecting the taxpayers, not passing go and collecting $200 and the rest of the obsessively unspecific campaign that Rob Ford ran, but in reality it seems to have had an actual definition of its own. The mayor’s office is now isolated from the rest of council, the media, and to some extent the city itself. He doesn’t publish his schedule, ducks out of council whenever he has something better to do (like high school football), and only communicates with the media outlets that are most friendly to his own agenda. Much like the partisan wave he rode to power, city hall is divided in a way we haven’t seen in decades, if ever. You’re either with the mayor or against him. You either like streetcars or you like subways. You’re either a good, taxpaying, salt of the earth citizen, or you’re a downtown latte-sipping leftie lunatic. There is no in between anymore. When you cross that line from Etobicoke or Scarborough into the old city of Toronto, you may as well be crossing a political ocean of difference. I didn’t vote for Rob Ford, not for mayor, not for councilor. Is this what you wanted, Toronto? I feel as though in Toronto we need ppl, like us, to speak up about issues. Your article does a fine job of what articulating many things that are in the news today. For example, I did not know about his ward is/was/will be very under developed. With that being said, I think all this article is missing is some of your opinions; what you think Toronto deserves/needs? – Build a casino- people gamble already and at least now the city can get its share, instead of Niagara.